It garnered some attention yesterday as it was presented but overall passed without much fanfare. 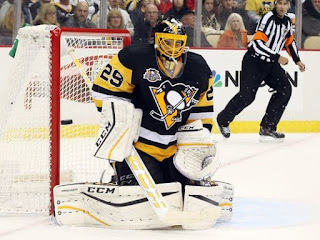 It was, in essence, the final act of adoration from Marc-Andre Fleury towards the Penguins. 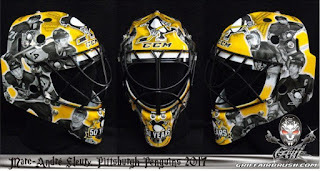 As the Penguins fully unveiled their full stadium series uniform, out leaked Matt Murray's pads and more importantly Marc-Andre Fleury's helmet. Designed by Stephane Bergeron, it chronicles his favorite teammates in his ten plus years. Included are not just photos of former and current players, but also the names of those who couldn't be painted. Photos like Mario Lemieux, Chris Kunitz, Evgeni Malkin, Sidney Crosby, Max Talbot, and Kris Letang adorn the sides of his mask. 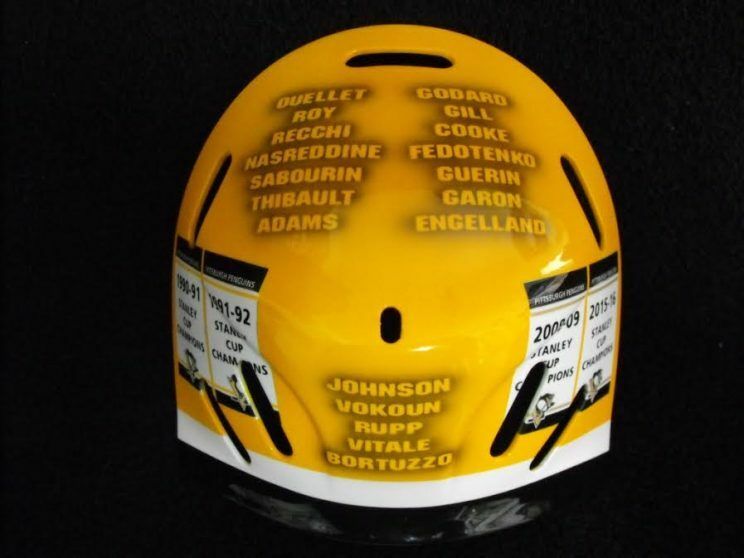 Further names of Tomas Vokoun, Mike Rupp, Joe Vitale, Joe Bortuzzo, Michele Ouellet, Mark Ricchi, Alain Nasreddine, Danny Sabourin, Jocelyn Thibault, Ramzi Abid, Colby Armstrong and more adorn the parts of the mask that aren't visible via photo. It's the mask of a man that knows his time is coming to a close in the city that he'd called home for over a decade. It's the sign of a guy who is ready to move on but wants to let the fans, friends, and franchise know how much they've met. The Penguins take on the Flyers at Heinz Field on February 25th. It's their final home game before the March 1st trade deadline. It may be his last time in a Penguins uniform. It would be an appropriate ending to a recording setting career for one of the Penguins most decorated players.